Tickets are on sale now for an exciting trip to San Diego for the Miramar Air Show on Friday, September 30. 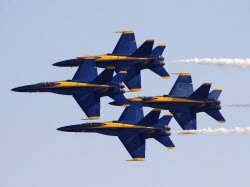 The largest and best air show in our nation featuring the Blue Angels will once again showcase amazing aerial performances by both military and civilian aviators. Reservations include special observation-deck seating and unlimited drinking water. Offered through the Huntington Beach Council on Aging’s Travel and Trips program, the price $83.00. The tour bus departs from the Michael E. Rodgers Seniors Center, 1706 Orange Avenue at 8:30 A.M. and returns at 6:30 P.M. Register in advance at Rodgers Seniors Center on Tuesdays 9:00 – 11:00 am, or Thursdays and Fridays from 1:00 – 5:00 pm. For more information call 714-536-9387. To see all of the HBCOA’s upcoming trips through the Travel and Trips program visit, www.hbcoa.org.